The cantata for the 20th Sunday after Trinity. "Ah! 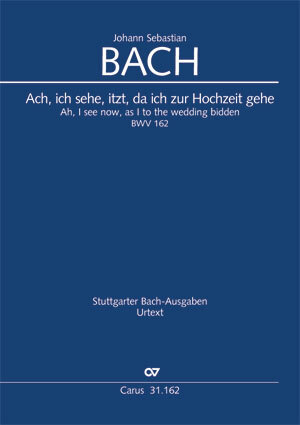 I see now, as I to the wedding bidden", BWV 162 was first performed on 25 October 1716 in the Castle church at Weimar. During the first year in his position as Thomaskantor, Bach made a revival performance of the cantata on 10 October 1723. For this Leipzig version he added an additional obbligato voice in the first movement and in the final chorale he added a “Corno da tirarsi”, which played colla-parte with the soprano. However, we do not know what this mysterious instrument looked like. For performances today we recommend using a trumpet or a slide trumpet. The cantata begins not with an introductory chorus, but rather with a sonorous bass aria with a string accompaniment and obbligato trumpet. The following movements, movement 2 through 5, are also performed by vocal soloists. The third movement, a soprano aria, presents a peculiarity: the obbligato wind parts were not contained in the original version of this cantata. Our edition offers a reconstruction for the flute, made by the famous Bach interpreter and expert, Masaaki Suzuki.